Furious trainer Danny O'Brien says he has been "thrown under a bus" as a result of Racing Victoria's indiscreet handling of drug tests of two of his horses. The tests were yesterday revealed to be negative. Flemington-based O'Brien said Racing Victoria had shown no discretion in its handling of the multiple testing of Kutchinsky, which won, and The New Boy, a narrow runner-up, at Flemington last Saturday. "The last 48 hours has been a disaster for my stable since news of this testing was put in the public arena," O'Brien said. "The innuendo has been constant and utterly unfair and unnecessary. When does RVL ever show any discretion? I have an unblemished record yet I had to endure this nonsense." Kutchinsky and The New Boy were subjected to three blood tests on the day, including a final test at 7pm at O'Brien's stables. The tests, part of a new regime aimed at nailing drug cheats, were conducted to determine if O'Brien's horses had been given an illegal race-day bicarb drench. Horses were tested similarly after Sunday's Ballarat race meeting. A furious O'Brien contacted Racing Victoria chief executive Bernard Saundry at 1pm yesterday demanding the test results be fast-tracked. "Originally I was told it would take days but there was no way in the world I was going to cop it. 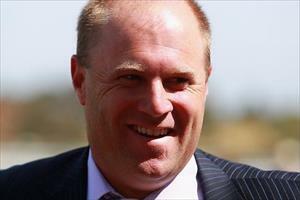 I knew they'd come back negative," O'Brien said. O'Brien called on chief steward Terry Bailey to show more discretion in protecting trainers from innuendo. "RVL has a long history of this," O'Brien said, adding he was "dumbfounded" the rationale for the testing of his horses was, according to Bailey, that "O'Brien had a successful day". "Isn't (that) what we all aim to do? Have a successful day?" he said. "(Bailey) also said a reason was that the horses were well backed. What? I can't control if punters reckon my horses should be well backed. "I'm all for full-on drug testing but it's up to RVL to conduct testing discreetly, without tarnishing reputations of innocent people."